HOW WILL A MEDICAID WORK REQUIREMENT AFFECT PEOPLE WITH DISABILITIES? Last Thursday, the Trump Administration invited states to add a work requirement to Medicaid eligibility. States and the federal government jointly fund Medicaid, but states are responsible for running it. The federal government cannot impose work requirements without Congressional approval. 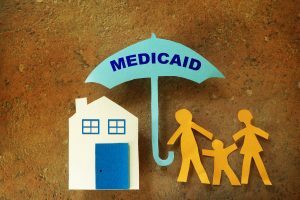 However, states can impose a work requirement by requesting a waiver from the regulations for new programs that carry out the underlying mission of Medicaid. States do this by applying for a waiver and having it approved by the President. Hence, it is news when the President of the United States invites states to do this. Presumably, the work requirement will exempt children, pregnant women, the elderly, and people with disabilities. There is hope that it will also exempt full-time students and family care-givers. Assuming all of these groups that currently receive Medicaid would be exempt under the new work requirement proposal that only leaves a small group that would be affected by it. According to research by the Kaiser Family Foundation, only 1 in 10 people who receive Medicaid would be subjected to the work requirement. Kaiser research further shows that in the non-exempt populations, more than 50% of the adult Medicaid recipients who would not be covered by the exemption are already working. Thus, a relatively small portion of the individuals who receive Medicaid would be affected. However, several experts noted that the federal government will not be providing federal resources for states to administer their work requirements. Federal law requires Medicaid dollars to pay for actual health care only. Analysis of this funding issue suggests — without designated funding, states could struggle to effectively implement their work requirements and any bureaucratic snafus could result in people who need and should qualify for Medicaid coverage losing it. I have previously blogged on how under-funding the Social Security Administration results in long delays and unwarranted denials for legitimate claims. Research analysts address this problem. “The question raised by these data for states is — is it worth the cost to screen and track enrollees when only a small minority isn’t working who are potentially able to work,” Most people on Medicaid who can work do work. A recent report in The Atlantic summed it up: instead of spurring employment among the sliver of people left able and wanting for jobs, it’s more likely that the requirements will simply push those people who can’t work out of the program—leading to fewer people on Medicaid overall. Whether Georgia intends to apply for work requirement for Medicaid through this Administration remains to be seen. Georgia elected to not expand Medicaid under the Affordable Care Act – probably because legislators anticipated a repeal of the act which did not occur. Georgia has one of the highest rates of uninsured populations in the country. A loss of Medicaid dollars might negatively impact urban and rural hospitals who serve these populations. Tagged: "Medicaid" "Medicaid work requirement"